Many castles come with a legend at their beginning. They are fortresses constructed primarily of wood and stone.
. 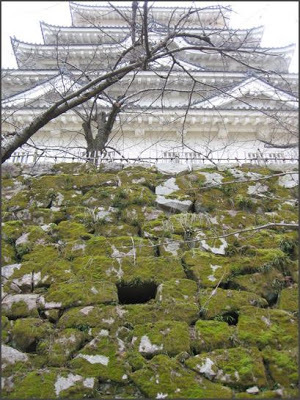 The Japanese Castle (shiro, -jō 城) . The basic information about every castle is now in the wikipedia. The hill where the castle is located is called 館山 Tateyama. It had been built by a Lord named 渋谷 Shibuya. Then came 伊達正宗 Date Masamune and raided the castle, with nothing to remain. On the night when the castle fell in the hands of Masamune, there was the sound of many birds wings heared before the castle vanished. This all happened because someone had betrayed the castle owner. It had been built on a hill in the form of a crane 鶴. So Masamune's soldiers changed the form of the hill and the castle was lost. 鶴ヶ城 Tsurugajo, Tsuruga Castle, Castle of the Crane. The castle looks like an elegantly flying crane. 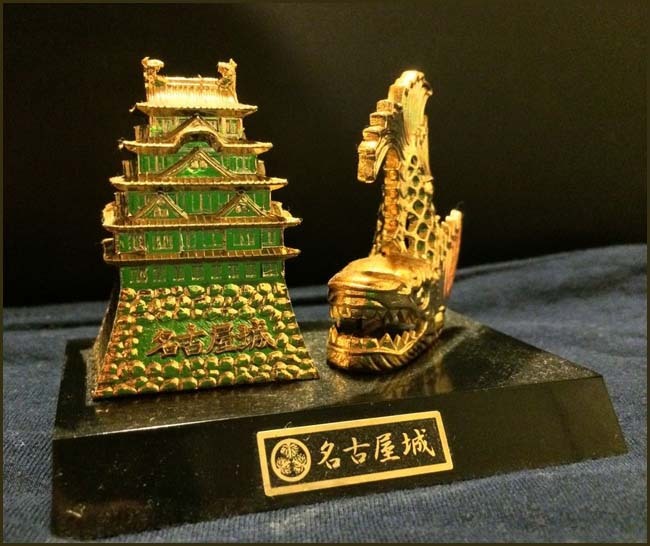 A female deity called Osakabe no kami おさかべの神 is venerated in the top of the tenshukaku 天守閣 main castle tower. 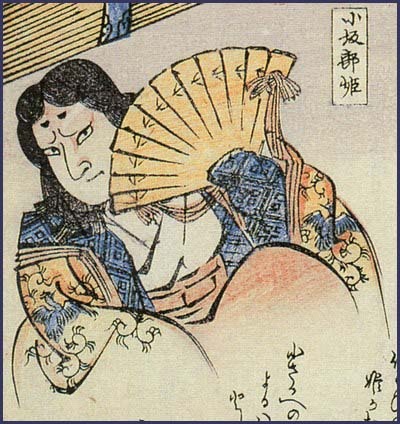 Other sources quote Osakabe no Miko as a Yokai 妖怪 monster. She comes out once a year and tells the fortune of the Castle owner. 刑部明神 Osakabe Myojin was venerated. 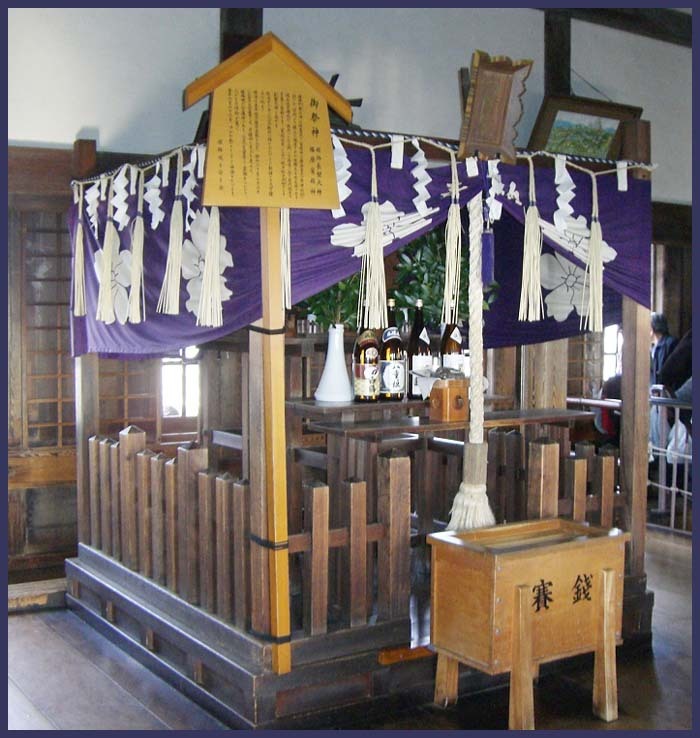 This deity and its shrine were re-located at the time Toyotomi Hideyoshi had the castle built anew. The soul of its founder, Kato Kiyomasa, is still alive in the castle. He protects the outer corridor from enemies, who try to enter the castle.
. Kato Kiyomasa 加藤清正 (1562 - 1611) . juukurei, juu kure i 銃くれ井 "well to give back the gun"
During the time of rivalry between the warlords 群雄割拠 this castle had a special power. When looking down from the castle the formation and numbers of the enemy could be clearly seen. When the enemy approached, it looked rather low but when the enemy retreated it retained its former hight. When the enemy had reached the sixth juncture uphill to the castle, the castle began to look higher and higher and they could not advance. But then the enemy built a well on the spot that was about the backbone of the crane and so the castle lost its magical power.
. Tengu no ma no yuurei 天狗の間の幽霊 The Ghost of the Tengu Room . 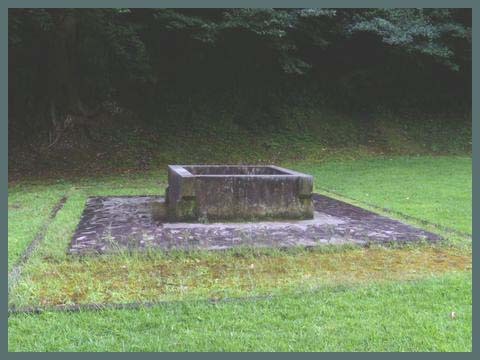 When Tada Kasuke and his followers (gimin 義民) were executed they cursed the castle. Due to their deep grudge, the castle began to slant to one side. ..... He was caught and executed along with twenty-seven farmers without trial. The rebellion has been called the Jōkyō Uprising, Jokyo Sodo, or the Kasuke Uprising 加助騒動. Below the tower keep of Matsumoto castle there was a famous cherry tree called 八幡太郎駒繋ぎ桜, Hachimantaro koma tsunagi, where "Hachiman Taro bound his horse", - its stump is still there and now a new tree is blossoming. This is one of the many trees related to Kappa legends and festivals about koma tsunagi no ki 駒繋ぎの木 "a tree to bind the horse".
. Kappa densetsu　河童伝説 Kappa Legends - Introduction . There are various castles with this name, "Pine Mountain Castle" in Japan. A retainer of 蒲生家 Kamo clan of Matsuyama, 松本忠四郎 Matsumoto Chushiro, went to 久万山 Mount Kumasan and played the flute for a Tengu. When asked for a reward, he said he did not want anything, but the Tengu handed him a box for writing utensils 文箱. When the Lord Kamo opened the box there was a piece of paper with the words 蒲生家断絶 - The Kamo clan will be extinguished. And indeed, so it happened soon after. The frogs in the moat of the castle do not croak.
. Isoragami 磯良神 - Azumi no Isora 阿曇磯良 . also called 川上城 Kawakami Castle. 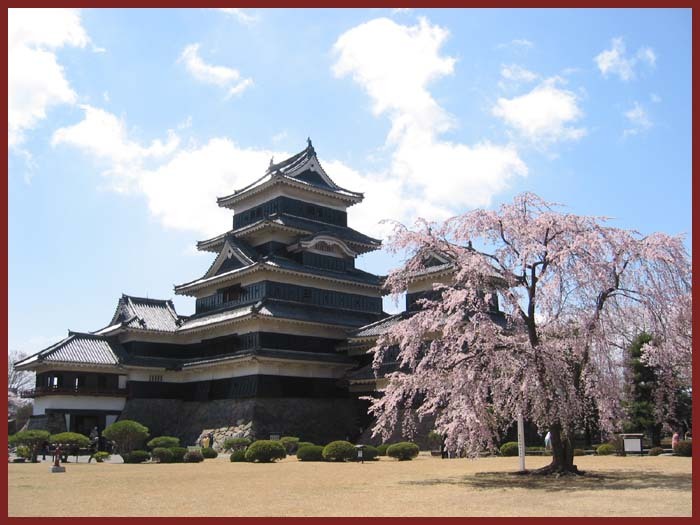 The castle had been built in 1303 by 川上孫二郎 Kawakami Magojiro. 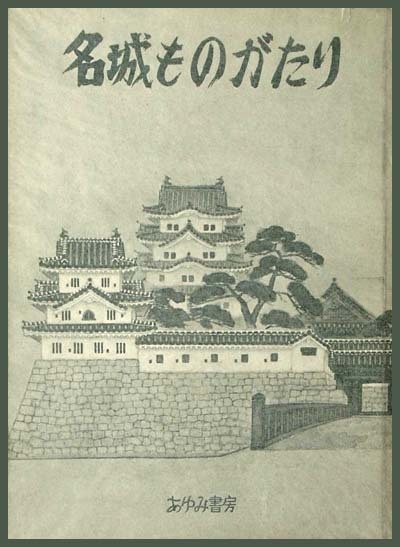 It was a mountain castle (yamashiro), but is lost now. Once Ise no Shiro 伊勢の四郎 captured some robbers in a deep mountain forest, but he saved the daughter of one in exchange for a pair of golden shachihoko 鯱. They are still to be seen on the roof of Nagoya castle. They were crafted not only to show off the power of Tokugawa Ieyasu, but also took a role of war funds in an emergency. ... 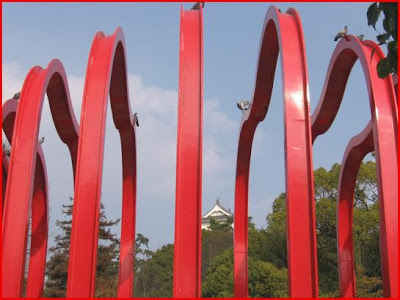 However in 1726, 1827, and 1846, when the domain of Owari experiencing financial difficulties, the Owari government removed the shachihoko scales and recasted them. in order to protect them from big water birds named 'kou' in Japanese (these wire nets made for a funny story later). A legend said that the 'kou' brings a dead twig aflame. The 'kou' once made a nest and put the fin to good use. Once at the moat near 名古屋城南門 the South Gate of the castle there was a pillar almost like smoke, of an amazing hight and length. It was made of millions of mosquitos. People later learned that the lord of the castle had died that night. At the South-Western end of 篠島 Shinojima in Aichi there is a huge rock formation that would make many "pillow stones" for a castle wall. 加藤清正 Kato Kiyomasa, who was a famous castle builder, wanted to move them to Nagoya and had many workers undertake the job. But it was just not possible to move the rock and Kiyomasa had to give up and leave them behind. Although Shinojima is a small island, it has a history rich with stories.
. Saint Mongaku 文覚上人 and the 太郎坊 Taro-Bo / 次郎坊 Jiro-Bo cedar trees .
. 足長小僧 Ashinaga Kozo- Yokai .
. Gabi Greve at Fukuyama Castle .